With more than 62,000 units and $35 billion in sales annually in the U.S., is limited-service pizza a growth segment? What about the full-service pizzeria chains and independents? It may not be about the pizza. It may be more about the speed of service, convenience and the freshness of the pizza. Following the proliferation of better burgers and better sandwiches, now comes better pizza. Before jumping to conclusions, it might be best to define fast-casual pizza, consider the pros and cons and, ultimately, get a better idea of what is driving this trend and where it may be headed. Fast-casual pizza is loosely defined as counter service, made-to-order, custom fresh pizza with a check average of $9-$12, served in a contemporary, sophisticated atmosphere. The made-to-order pizza segment is comprised of fast-casual brands in which customers choose their ingredients, including the dough, sauce and toppings, along a make line. Pizzas are cooked in high-speed ovens that often are the centerpiece of the restaurant’s design. The trend marks a move away from delivery and discounting, two pillars that limited-service pizza chains rely upon. These concepts court lunch customers more than traditional pizza brands, as well as those looking for fresh or better-for-you products. Traditionally, pizza is generally designed for small groups, families and special occasions, where large portions and high value are important. In addition to a strong price-value equation, convenience is high for consumers, as most pizza is ordered for delivery or carryout and consumed off-premise. If you are not pressed for time, going to a pizzeria pub is a great place to find fresh, hot pizza and a pint of your favorite craft beer. Along with a much broader menu of appetizers and desserts, pizza pubs continue to be a great destination for a meal with friends and family. And if you are pressed for time, then pizza by the slice is a good option for a grab and go. So what is driving consumer demand for this new format of made-to-order pizza? Let’s start with the customer demographic. Fast-casual pizza appeals to younger Millennials and affluent consumers. Brands are setting up in high-income trade areas where these customers are present. Health and wellness concerns and active lifestyles are also a factor in thinner crust and healthier topping pizzas that have strong fresh flavor profiles. 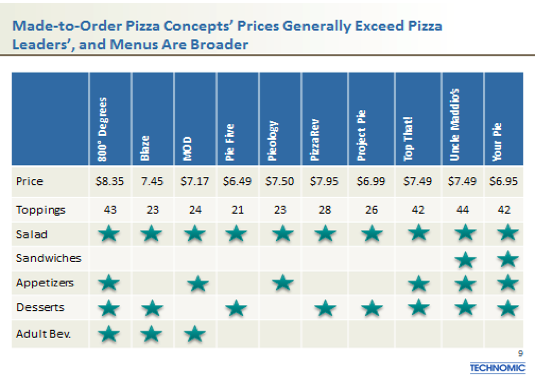 In Technomic’s recent Pizza Consumer Trend Report, 65% of consumers polled indicated they agree completely or strongly agree that they would like more restaurants or pizza establishments to offer premium ingredients or toppings, while 55% wanted all-natural toppings and 41% were looking for locally sourced ingredients. These “health-halo” descriptors are strong drivers of perception and a healthier product. And what about the downside to this new trend? Although lunchtime opportunities are very strong, fast-casual pizza concepts may be challenged by the dinnertime “Achilles heel” for the segment. How do you generate strong sales in the dinner daypart? With a fresh product that is best eaten shortly after it’s served, made-to-order pizza will find it hard to compete with traditional pizza concepts. The narrow menu and lack of adult beverage choices at these fast-casual concepts will make it harder to attract groups that are looking for a destination and not just a quick bite. And for consumers who are looking for a lower cost check average below $9.00, this type of experience may be just a bit beyond their reach. There is no doubt that the fast-casual pizza growth will continue, stealing share from other fast-casual players and working hard to steal share from quick-service, casual-dining and family-style operations. Franchisees looking for complementary concepts and points of differentiation will drive growth, so we expect to see this trend continue for years to come.